Armadillos have relatively low metabolic rates and carry very little fat on their bodies. Because of this, these animals tend to avoid the cold, preferring, instead, to live in temperate and warm climates like those found in rain forests, grasslands, and semi-deserts. Even in these habitats, to save on energy reserves, armadillos sleep up to 16 hours a day. Much of their waking lives is spent looking for food, primarily insects. Most armadillo species forage in the early morning and evening hours for a variety of invertebrates and insects, including beetles, grubs, and worms. Because, like many burrowing animals, armadillos tend to have extremely poor eyesight, their hunting skills rely on their abilities to smell their food. Fortunately, these animals have exceptionally keen noses. Ants and termites are favorite foods among armadillos; their strong legs and large front claws help them burrow as deep as they need in order to find their favorite meals. Once the bugs have been found, the armadillo's long tongue does an excellent job of extracting ants and termites from their tunnels. What's more, armadillos secrete a particularly sticky saliva to help them hang on to even the most agile of insects. 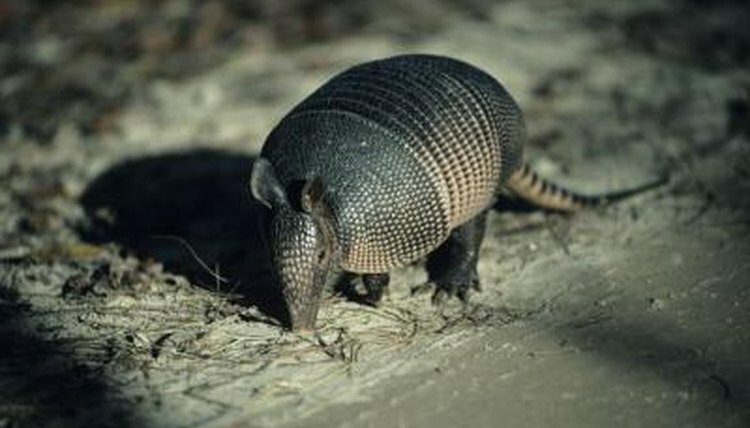 Research shows that armadillos seem to be one of the few natural predators of the pesky fire ant. They have been known to dig into fire ant mounds during droughts when other insects are more difficult to find. While this might seem terribly unpleasant to anyone who has been bitten by an adult fire ant, armadillos tend to eat only the young, defenseless broods that are often located near the surface of the colonies. Armadillos that have been injured and rescued in the wild still need a diet that includes insects and other invertebrates in order to survive in captivity. When away from their natural habitats, armadillos can be fed bait worms, meal worms, grubs dug from lawns or out of rotting wood and, of course, ants.